Esthetic ceramic crowns or partial crowns in a single visit. Ask me about CEREC. After the consultation, a camera captures the area to be treated. The dental prosthesis is then created as a 3D model on the computer. The restoration created on the computer is subsequently milled from a ceramic block. The finished ceramic restoration is inserted just a little while later. Say goodbye to biting on impression material for several minutes, having a numb mouth and jaw ache. Your dentist now has a camera that can capture your full dentition in seconds and then transfer this to the computer. Temporary prostheses are exactly what the name suggests: temporary. With CEREC the final prosthesis is inserted directly without any temporary compromises needed. 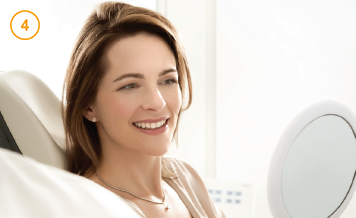 CEREC enables your dentist to insert esthetic ceramic crowns or partial crowns in a single session. The advantage of this is that only one appointment is necessary, which means only one injection, and then you can deal with other things than visits to the dentist. More than just a theory: With CEREC you can rely on quality that has been proven millions of times over in the practice. Furthermore, thanks to your new dental prosthesis made by CEREC, your smile will be just as lovely many years later as it is directly after receiving the prosthesis. Due to the translucency of ceramics, the dental prosthesis looks like a real tooth. In a ceramic dental prosthesis, no dark edges are visible as is so often the case in conventional crowns. Ceramic is very close to the hardness of the natural tooth, thus preventing wear of the tooth, which unfortunately so often occurs with other materials. Ceramic is very well tolerated so allergic reactions are largely excluded. This is not the case with other methods and materials. 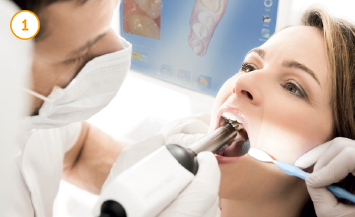 The CEREC method is a gentle treatment for your teeth. Only the carious tooth surface is removed. The remaining healthy tooth substance is preserved. The esthetic alternative to gold, amalgam, and composite resin fillings. Filling that are attached to the tooth are called ceramic inlays and onlays. Ceramic inlays and onlays, which have a higher quality than composite resin fillings and are more esthetically pleasing than gold or amalgam fillings due to their natural color, are becoming steadily more popular. The most esthetic solution for treating severely destroyed individual teeth. Conventional metal crowns are associated with other disadvantages than just inferior esthetic appearance. Gum irritation and impairment of taste or other sensations occur very frequently. All-ceramic crowns not only allow the perfect restoration of individual anterior and posterior teeth, they also give you renewed self confidence. The most esthetic solution for chipped or discolored anterior teeth. All-ceramic veneers are ultra thin, highly esthetic veneers that are glued directly onto the visible surfaces of natural teeth, mainly at the front of the mouth. Optically, no difference can be detected between all-ceramic veneers and the adjacent natural teeth. You'll see: Your entire appearance will improve dramatically. 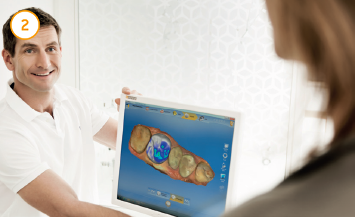 Ask your dentist about CEREC.